The photographs on this page illustrate key poses for balancing our hormones, relieving stress, supporting pelvic health and replenishing our energy reserves during all the stages of life. These poses are vital for both men and women at midlife and beyond, especially as we face the many changes that life brings. For easy reference, here is a list of the key poses for pre and post menopause that are suitable for beginners. Stay as long as you like in each pose. If you are tired and have only ten minutes, I recommend Supported Legs Up the Wall Pose, which brings your heart below the level of your legs. This in itself is restful and will help replenish your energy reserves. Supported Child’s Pose. A restful pose to help calm your nerves and relax your back. Good to practice before and after Downward Facing Dog Pose. Supported Downward Facing Dog Pose: Menopause Medicine! If your body is very stiff, or you have wrist or shoulder problems, your teacher can show you how to practice the pose in a way that is right for you. This is a key weight-bearing pose for strong, healthy bones. Relax again in Child’s Pose, with or without support, after Downward Facing Dog Pose. a key pose for replenishing your adrenal reserves. If I had to pick two poses to practice during menopause every single day for at least ten minutes, it would be this pose and Supported Bound Angle Pose. Note: Beginners are often more comfortable with one or two folded blankets, instead of a bolster. Or simply relax with your legs up the wall, a folded blanket under your head. If you cannot get comfortable with the legs straight up, try moving a few inches away from the wall and bending your knees. Or relax with your lower legs over the seat a chair. Legs Up the Wall Pose with Feet Wide Apart–Refreshing and relaxing. Supported Bridge Pose –The “Menopausal Bridge Pose”. Deep Relaxation Pose with Bolster Under the Legs– to relax the body, soothe the nervous system and bring peace to the mind. Learn to practice these poses under the guidance of a knowledgeable teacher. 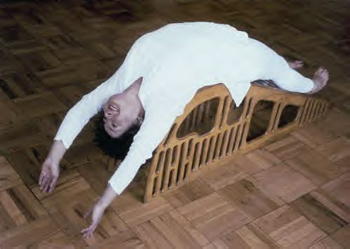 Supported Shoulderstand with Chair, a key pose for pelvic health, cooling hot flashes and balancing the endocrine system. Yoga Wall Ropes– An Investment in Your Health for Years to Come. 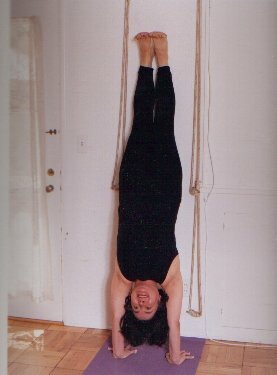 Yoga Wall Ropes are the antidote for the stiffness that tends to settle into the body during menopause. They stretch and strengthen the whole body and tone pelvic and abdominal organs. Handstands strengthen the bones of the upper body and help prevent osteoporosis. 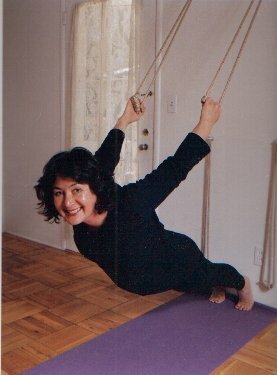 Supported Lying Down Heroine Pose — opens the chest and is particularly beneficial for the health of the heart. Also stretches the abdomen and aids digestion. Helps relieve discomfort and stiffness in the legs and feet. Supported Backbends such as lying back over a back bender help recharge the adrenal glands and replenish energy reserves during menopause. Backbends open the chest, lengthen the spine and strengthen the cardiovascular system. They help lift our spirits and give a feeling of inner joy and happiness.